Hilary strengthens a little as it continues moving westward. 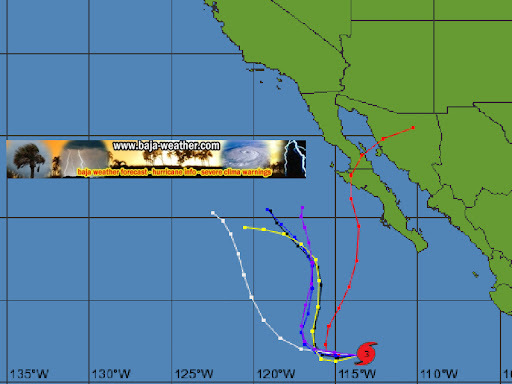 At 800 am PDT/1500 UTC the eye of Hurricane Hilary was located near latitude 16.7 north/longitude 113.1 west. 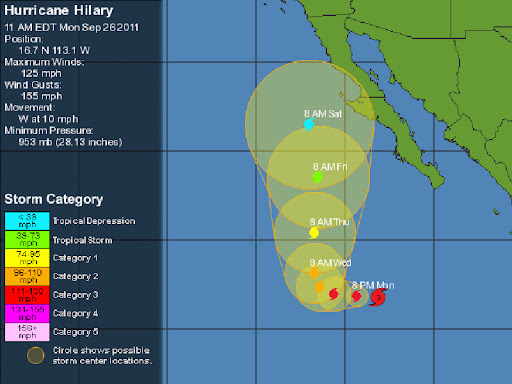 Hilary is moving toward the west near 10 mph/17 km/h. This general track is expected to continue over the next 24 hours with a decrease in forward speed. A turn toward the west-northwest is expected by late Tuesday followed by a turn toward the northwest early Wednesday. Satellite imagery indicates that maximum sustained winds have increased to near 125 mph/205 km/h with higher gusts. Hilary is a category three hurricane on the Saffir-Simpson hurricane wind scale. Some fluctuations in strength are possible during the next day or so but overall gradual weakening is expected during the next 48 hours. Hurricane force winds extend outward up to 35 miles/55 km from the center and tropical storm force winds extend outward up to 105 miles/165 km. Swells generated by Hilary are affecting portions of the coast of southwestern Mexico and southern Baja California. These swells are likely causing life-threatening surf and rip current conditions.